Station Hollywood: In 2015 Salman Khan's Bajrangi Bhaijaan had humanitarian message. In 2015 Salman Khan's Bajrangi Bhaijaan had humanitarian message. Salman Khan’s Bajrangi Bhaijaan has very good humanitarian message.Salman Khan’s new film Bajrangi Bhaijaan released on 17th July, 2015, did business of more than 32 crores on the first day. The film has excellent humanitarian message. 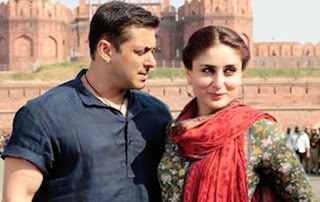 The film had been directed by Kabir Khan who had previously directed Salman Khan’s Ek Tha Tiger few years back. Salman Khan and Rockline Venkatesh produced the film. The music had been composed by Pritam. The film is all about a little girl played by Harshali Malhotra who got lost in India. She belonged to a hilly district of Pakistan. Salman Khan met her in Delhi but as she was dumb he could not make out her place of residence. He kept her in the house of Kareena Kapoor and her father Sharat Saxena. Sharat Saxena incidentally gave Salman place to stay when his father died some time back. After that Salman Khan entered Pakistan without Passport and Visa. He was a devotee of Hanumanji. So told the truth that he entered underneath the fencing in the deserts between India and Pakistan. He got beaten up by the Pakistani police. He got help from a Pakistani journalist played by Nawazuddin Siddique and Om Puri, a religious person. Ultimately he could reach Munni or Shahida, the child to her parents in Pakistan in Sultanpur district. The child at the end spoke out. The film gave the message that nature shares all the assets in both India and Pakistan. Human love and affection could have softened the relationship between the human beings of both the countries. It is the law enforcers and policy makers who had stemmed hatred between the two country men. Salman Khan played his role in an outstanding way. His innocence and human feeling touched everyone. Kareena Kapoor and Sharat Saxena were brilliant in their roles. Om Puri did a cameo in his short role. Nawazuddin was again brilliant and very different from his villainish roles. The music of Pritam was outstanding. Atif Aslam’s song “tu chahiye”, Adnan Sami’s qawalli “bhar do jholi meri”, Mohit Chauhan and Palak Mucchal’s song “chicken” and Javed Ali’s song “tu jo mila” touched everyone. Salman Khan in the past had shown that he was the badshaah of eid.